"When the boss says 'I like you,' it gives you a little bit of comfort," Law said of Rowling, screenwriter of the "Harry Potter" prequel series that is based on her 2001 book "Fantastic Beasts and Where to Find Them"
This image released by Warner Bros. Pictures shows Jude Law in a scene from "Fantastic Beasts: The Crimes of Grindelwald." 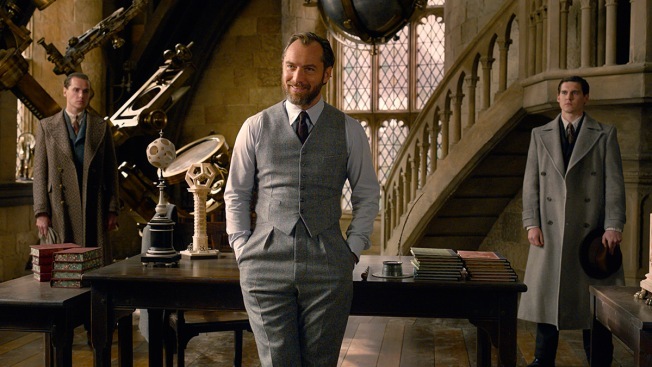 When Jude Law met with J.K. Rowling about portraying the younger version of Albus Dumbledore, the two discussed how to rebuild the fan-favorite character from the "Harry Potter" films. Law spent an afternoon jotting down notes from Rowling who talked to him about Dumbledore's life before becoming the world's most powerful wizard. The British actor walked away with a vote of confidence from the famed author, alleviating some pressure on him. "When the boss says 'I like you,' it gives you a little bit of comfort," Law said of Rowling, screenwriter of the "Harry Potter" prequel series that is based on her 2001 book "Fantastic Beasts and Where to Find Them." ''You can't help but step into something like this, playing a part like this without feeling a sense of responsibility, a fear of letting someone down. But when the creator gives you the thumbs up, it's a blessing." Dumbledore was a Hogwarts headmaster in the "Potter" franchise commonly known for his silver hair and long beard, sporting a loose robe. He was played by Michael Gambon after inheriting the role from the Richard Harris, who died in 2002. Law's youthful version enters in his mid-40s wearing a three-piece suit with short auburn hair in the sequel "Fantastic Beasts: The Crimes of Grindelwald ," which will be released Friday. It's the second part of a five-film franchise that started with 2016's "Fantastic Beasts and Where to Find Them," which grossed $813 million worldwide. In "Grindelwald," Law's character works with his former student Eddie Redmayne's Newt Scamander to thwart the divisive wizard leader Gellert Grindelwald, played by Johnny Depp. The film also stars Katherine Waterston, Zoe Kravitz and Ezra Miller. For research, Law read several Harry Potter books that referenced Dumbledore, rather than solely watching the previous films featuring the elder character. With the help of Rowling and director David Yates, they wanted to build from the "ground up." "I was then given the opportunity to create him without feeling the pressure to mimic or impersonate or indeed hang the character too much on past representations by the other actors," Law said. "There were certain traits I wanted to include. I loved his humor, the twinkle he had. He sees the good in almost everyone. He has a good heart. But I was able to layer him up a little more." Redmayne said the studio perfectly cast Law as Dumbledore, who doesn't necessarily show his true powers and appears only in about six scenes — most of which are interactions with Scamander. "Being a formidable, formidable actor with great gravitas and weight and yet at the same time, he has this kind of playful quality," Redmayne said of Law. "And I'll never forget our first scene, which was the first time we see each other in the film. I just saw his back, basically. And the way he turned around, it was instant. It was like in one look, he had managed to inhabit that. I hadn't had any expectations about Dumbledore. But somehow it was solidified in one look." The sequel picks up after Grindelwald was captured by the Magical Congress of the United States of America with the aid of Newt at the end of the first film. But the villainous wizard finds a way to escape custody and assembles a group of pureblood wizards who support him to rule over all humans in 1920s Paris. Law says the film opens the door to many dramatic paths and explores a more troubled time in Dumbledore's life along with his once-close relationship with Grindelwald. Rowling announced in 2007 that Dumbledore is gay after the release of "Harry Potter and the Deathly Hollows," the final book in the series. Some on social media criticized the author's decision to unveil and tinker with the beloved character's sexuality, but she has defended her actions. Law assures the story is more focused on his character's complicated relationship with Grindelwald from decades ago, rather than Dumbledore's sexuality. "His sexuality doesn't define him, but the relationship with Grindelwald does," Law said. "I believe, and (Rowling) would agree, that Albus had many intimate relationships. And the one he has is the love of his life, which is damaged. It becomes even poisonous and sends the two of them in opposite directions. He's now in his middle age, around my age 45, and he's still recovering from a relationship that he's trying to work out from when he was 20. That's a long time. I could barely remember what life was like when I was 20." The actor applauded Rowling for being fearless in creating "layered" and "diverse" characters such as Dumbledore in a fantasy world with "escapism and magic." "Isn't it wonderful that we're in a world where finally, finally a franchise like this has a great character and it doesn't matter. But (Rowling) is brave enough to put it out there and say 'Let's do this.' People should be able to handle this. They can. It's as we should be." Law called his introduction as Dumbledore a good "warmup" as the franchise progresses. The actor has a few big films ahead on his plate including "Captain Marvel" and "Vox Lux," but is looking forward to filming the third installment of "Fantastic Beasts" next summer. It'll give Law time to grow his beard. "Finding all those pieces of him were fun" he said. "I eased into the part, but the line was drawn at the end of this one. It's only going to get deeper."